FRESH SHELLING BEANS (Tongue of Fire): Italian heirloom shelling beans are large, round, and cream with red streaks and stringless, red-streaked green pods with a nutty flavor and creamy texture when cooked; can be substituted for Cannellini, Great Northern, or Pinto beans. How to use: can be eaten fresh, frozen, or canned; excellent sautéed with garlic or added to soups–eat the fresh-shelled beans, not the pods; steam or boil for 10 min. or so until tender. How to store: refrigerate fresh beans in a tightly covered container for up to 5 days. BROCCOLI: deep emerald green, tiny buds that are clustered on top of stout, edible stems. CARROTS (Sugarsnax): smooth, uniform, 9-inch tapered roots that are tender and sweet. How to store: Remove greens from roots and refrigerate dry and unwashed roots in plastic bag for up to 2 weeks; greens may last up to a week refrigerated in plastic bag–greens are great in Carrot Top Soup recipe, which can be found on our website! CAULIFLOWER (Amazing): medium-sized, white heads with domed, solid curds. How to use: Raw for salads and dips, steamed, sautéed, or roasted. How to store: Sweetest and best when used within a week when stored in the refrigerator, but can last up to 2 weeks. How to freeze: Blanch 2-4 minutes, rinse under cold water, drain and dry, pack into freezer bags. GARLIC: a bulb of several papery white cloves. KALE (Green Curly): well ruffled green leaves with strong, cabbage flavor. **Excellent kale chip recipe on website! LETTUCE MIX: a custom mix of red and green lettuces such as Rouge D’Hiver, Parris Island, Royal Oak, and Saladbowl. How to store: refrigerate in plastic bag for 2 to 4 days. SWEET ONIONS (Mars Red): purple-red onion with sweet flavor. How to store: wrap in damp towel/bag in fridge for 2-7 days. HOT PEPPERS: You will receive Poblano (known as “poblanos” when black-green and popular in Southwestern recipes; heart-shaped fruit, which is mildly pungent with a lightly sweet, medium-hot flavor) or Serrano (cylindrical fruit with excellent, very hot flavor; usually eaten fresh green in sauces, condiments, or as a key ingredient in fiery Mexican dishes). How to use: Handle hot peppers with gloves, and cut on glass plate. Often roasted, chopped, and used to season corn bread and cheese dishes; good for stuffed appetizers, jams, salsa, and pickles. SWEET RED PEPPERS: You will receive Apple Pimento (cylindrical, lobed-end fruits with mild, juicy, sweet flesh). How to use: eat raw for best nutrient retention, but also added to soups, stews, omelets, quiches, stir-fries, etc. How to store: refrigerate unwashed in hydrator drawer for 1-2 weeks. Peppers can be easily frozen by washing, chopping, and placing in freezer bags. Also, peppers can be dehydrated. How to store: Keep unwashed in cool, dark place in paper bag; ideal temperature is 38-40 degrees with 80-90% humidity, but no condensation. A basement or very cool closet will work. If too warm or stored with onions or apples, they will shrivel and sprout; light turns them green; don’t refrigerate, since the starches turn to sugars. SPINACH: crisp, dark green leaf—rich source of antioxidants & many nutrients, especially vitamins A, E, K, & C; delicious flavor when juiced. How to use: toss in fresh salad, add to sandwiches, sauté, steam, braise, or add to crepes, quiche, lasagna, and soups. How to store: refrigerate with a damp towel/bag for up to 1 week. How to freeze: Blanch leaves for 1-2 minutes, rinse in cold water, drain well, and pack into containers. Also, spinach can be pureed after cooking, frozen in freezer bags, and used in many recipes. SWEET POTATOES (Beauregard Sweet Potatoes): large, edible root related to the morning-glory family that has dark red-orange skin with a vivid orange, moist, sweet flesh; high in vitamins A & C.
How to store: store in a cool, dark place like winter squash. *Do not store in plastic or in fridge, unless cooked, turns black! TATSOI: an Asian green with small, spoon-shaped, thick, dark-green leaves with tangy, sweet flavor. How to store: refrigerate in plastic bag or wrap in a damp towel. WHITE HAKUREI TURNIPS and GREENS: A white salad turnip with round, smooth roots that have a sweet, fruity flavor with a crisp, tender texture. How to use: Roots are good in salads and soups. Greens are slightly sweet and can be boiled, steamed, sautéed, stir-fried, and since hairless, are good in salads. How to store: separate greens from roots and store each in plastic bag in refrigerator for up to 7 days. Acorn (small, green ribbed squash with pale yellow flesh, Buttercup (green, blocky, with a gray “button” on the blossom end; thick, dry, deep orange flesh; medium-dry and sweet; very dry at harvest, sweeter after a few weeks; dry storage), Spaghetti (3-5-pounds, pale yellow, oblong, smooth, medium size, only mildly sweet with “spaghetti” (stringy) flesh; bake like squash or boil and fork out the flesh, topping the “spaghetti” flesh with your favorite sauce; mildly sweet), Butternut (light, tan-colored skin; small seed cavities with thick, cylindrical necks; bright orange, moist, sweet flesh),or Pie Pumpkin (bright orange skin with dry, sweet flesh). How to use: boil or steam chunks for 15-20 minutes, or until tender; mash cooked squash with butter; or add uncooked chunks to soups or stews; add small amounts to yeast breads, muffins, cookies, pies. 1. HARVEST AT THE FARM: Please call ahead if you plan to u-pick or pick up on other days besides Farm Distribution Days (Wed. and Fri.), so we can make sure someone is around. U-pick Broccoli—$0.50/lb. Good time for freezing. U-pick Cauliflower–$1/lb. Good time for freezing. U-pick Green Beans for $1/lb. Good time for canning and freezing! U-pick Fresh Flowers– You may pick 1 bouquet of up to 15 stems per household at no charge as part of your share. U-pick Turnips–$1/lb. White Hakurei & Scarlet Red (Good time for lacto-fermenting. 2. THANKSGIVING SHARE AVAILABLE! 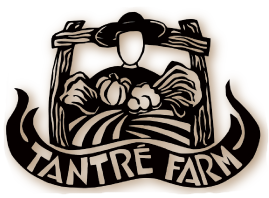 We are offering a Thanksgiving share for pick up on Nov. 19, the Saturday before Thanksgiving, at the Ann Arbor Farmers’ Market from 7 A.M. until noon or at Tantré Farm from 2-5 P.M. It will be $100 this year. Please request a form at Distribution Sites or call or e-mail us. Full payment needed by Nov. 12 for you to be registered. Non-CSA members are welcome to register. 3. VACATIONS or OUT OF TOWN: Please let us know a week ahead of time, or at least by Sunday of the week to be changed, if you know that you will not be picking up your share or you want to change your pick up date or location. Please make a strong effort to PICK UP ALL OF YOUR SHARES in the next few weeks. If you miss a share pick up, it is available at the farm ONLY for that day and 1 day after. Farm on Wed.–10 A.M. to 7 P.M.
Farm on Fri.–2 P.M. to 7 P.M.
Community High School (Sat. )—7 A.M. to 12 P.M. Welcome to the Extended Fall CSA Share season! The dynamic tension between the abundant end of summer and the desolate season of winter brings forth the most tender, sweet vegetation of any part of the year. This year’s fall season is particularly verdant perhaps due to the hurricane-induced rains of September and the Indian summer of October. The cauliflower and broccoli are especially robust. The turnips and radishes are tender and sweet with full, edible greens along with the tatsoi, spinach, lettuces, kale. In our cold storage we have stockpiled a lot of sweet potatoes, onions, garlic, squash, potatoes, shelling beans, and even a bit of the red peppers for awhile. In northern temperate climates from east to west, traditionally many cultures have stored late season vegetables by way of root cellaring, pickling, drying, canning, and freezing in order to preserve minerals, dietary fibers, and vitamins for the lean and chaste winter months ahead. It’s the time at the end of a season to preserve the best and the last of the season’s vegetables in a very simple, sustainable way. We harvest right at the peak of the vegetable’s maturity, and then store them for the shortest amount of time until winter. This is our perfect food moment to fatten up our food caches for the winter. If you want to freeze broccoli or cauliflower, this is the time to do it. We are loaded with abundance, so if you want to come and u-pick, come and get it! It’s time for making soup, sauerkraut, and kimchi. There is no more satisfying or thoughtful experience than to lay up a pantry of hearty, winter survival food. The best balance can be found in embracing the cold of winter and preserving the abundance of the fall. Please feel free to come out to the farm to embrace the vegetables and the season with us and u-pick some veggies. *Keep in mind-Cooks.com, Epicurious.com, Recipes.com, and especially www.tantrefarm.com for more recipe ideas. In a soup kettle, sauté onions, garlic, celery and sweet potatoes in olive oil for about 5 minutes. Add seasonings, except tamari, and the stock or water. Simmer, covered, about 15 minutes. Add remaining vegetables and beans. Simmer another 10 minutes or so – until the vegetables are tender. Add tamari and serve. *Tip: This soup freezes well. You can also throw in greens at the end, such as TATSOI or KALE or SPINACH.